2008 September archive | YORK BLVD. 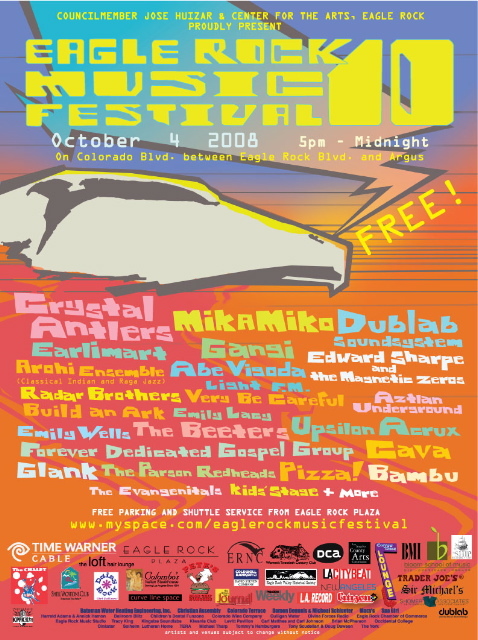 Something that cemented my love for NELA early on (back when many people thought there wasn’t anything to love…) is the annual Eagle Rock Music Festival. To be honest, most years I’ve been oblivious as to exactly when it will occur, but every year my heart flutters with excitement when I inevitably drive down Eagle Rock Blvd realize it’s in full swing. I love to see the hundreds people out in the streets, and hear the music coming form the Trader Joe’s parking lot, or in the Oinkster, or poolside at the Islander Motel. This year I don’t want to be oblivious, and neither should you. The Eagle Rock Music Festival will be October 4th. Below is the local press release full of details and highlights. Don’t miss this, it’s one of the best nights in NELA! LA City Councilmember Huizar and Center for the Arts, Eagle Rock team up to present a genre-bending, diverse line-up for their 10th annual free music fest including Crystal Antlers, Miko Miko, Dublab Soundsystem, Build An Ark, Gangi, Abe Vigoda, Radar Bros., and many more diverse acts spanning Jazz Fusion, Cumbia, DIY Eclectic Sounds, Classical Indian, Experimental, Hip-Hop, Rock, Folk, and More. LOS ANGELES (September 17, 2008)- Los Angeles City Councilmember Jose Huizar and Center for the Arts, Eagle Rock present the Tenth Annual Eagle Rock Music Festival, the yearly FREE music festival with a unique and independent community vibe, to take place on Colorado Boulevard in Eagle Rock, on Saturday, October 4, 2008, from 5p.m.-Midnight. An event that thrives by the support of local businesses and artists, the Eagle Rock Music Festival is created by the community and for the community, too. This anniversary year, the festival features more than forty diverse artists with local ties to Northeast Los Angeles and the surrounding neighborhoods of the Eastside, and Council District 14. Musicians perform at sixteen unique one-night-only venues ranging from tire shops and formal stages to coffee shops and even motel poolside up and down Colorado Boulevard, which will be open to pedestrians between Eagle Rock Boulevard and Argus Street. Each venue highlights a different type of music, going beyond genre boundaries to create a place where Angelenos of all-ages can find a melody, beat, or guitar riff to enjoy. By bridging underground artistic expression with the more mainstream, the festival brings together a diverse grouping of artists that would otherwise never be united in one setting. - Abe Vigoda, Crystal Antlers, Earlimart, Mika Miko, Princeton, Pizza!, Gangi, the Evangenitals and Edward Sharpe and the Magnetic Zeroes (a project of IMA Robot’s Alex Ebert) on the outdoor Emerging Stage, showcasing artists from the diverse variety of independent music scenes in and around LA’s Eastside. A free shuttle service to and from the festival will be available from the Eagle Rock Plaza, where limited free parking will be available for festivalgoers. The Plaza is located off of Colorado Boulevard in Eagle Rock where the 2 and 134 freeways meet. The Tenth Annual Eagle Rock Music Festival is being presented with the generous support of Time Warner Cable, Eagle Rock Plaza, the Eagle Rock Neighborhood Council, the Los Angeles Department of Cultural Affairs, the L.A. County Arts Commission, the Women’s Twentieth Century Club, Eagle Rock Chamber of Commerce, Bateman Water Heating Engineering, Shell Vacations, Curve Line Space, Macy’s, Daisy Rock Guitars, The Ship Studios, Kingsize Soundlabs, and the community and businesses of Eagle Rock. Media partners include Pasadena Weekly, L.A. Record, 88.9 FM KXLU LOS ANGELES, 90.7 FM KPFK LOS ANGELES, Citizen L.A., New Angeles Magazine, and the Arroyo Seco Journal. The Eagle Rock Music Festival is a centerpiece in the year-round free and low-cost arts programming of Center for the Arts, Eagle Rock, one of the last remaining arts and cultural programming centers in Northeast Los Angeles. Center for the Arts, Eagle Rock is a non-profit 501(c) 3 organization whose mission is to provide multicultural, innovative arts programming to the communities of Northeast Los Angeles. Programs include exhibitions, community festivals, free and low-cost after school arts classes, a Summer Art Camp, and more. For more information on the Center for the Arts, and its creative community programs, call 323-226-1617. 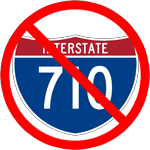 Those of you who’ve followed our sister site’s campaign to save the taco trucks might already know there are a few issues on which we don’t see eye-to-eye with the county. Recently, we connected harassing comments made to “uppity white folks” who think “they know what’s best for us poor brown folks” to the same IP address that has been erasing any mention of controversy to Gloria Molina’s wikipedia page. This address has also edited the wikipedia articles for The County of Los Angeles Board of Supervisors, Supervisor Don Knabe, and Supervisor Mike Antonovich. The clincher? That IP address links directly to the County of Los Angeles. “Troubling” doesn’t begin to describe this connection. I don’t want to drown you in the details, but read the full article here. Curbed has linked to us enough times that I don’t feel guilty borrowing one of their articles. They caught this postingfor a room for rent on Craiglist, which, despite its comical misspelling of “bur bur” rugs opens an interesting can of worms when it comes to pinning down a brief yet accurate description of our neighborhood. Please note this is Highland Park one block away from Eagle Rock. Please note this is not Highland in Hollywood.Please with all do respect if you think Highland Park is ghetto then please do not respond. I grew up in the ghetto; I know what ghetto is. Ghetto is the Sheriffs running thru your backyard at night chasing your uncle. Ghetto is walking home from the taco stand and hearing bullets fly by your head. Ghetto is someone coming up to you and asking if you want to buy an I.D. Highland Park has homes that range from $600,000.00 – $900,000.00 it is one of the most gentrified areas in L.A. A film editor lives across the street from me, 2 gay couples live on my street, a fashion designer lives around the corner, a lesbian couple lives around the other corner, and a hair stylist from one of the CSI episodes lives down the street, it is far from ghetto. The taco stands are being replaced by art galleries on York Blvd. I can no longer get a taco but I can tell you what contemporary art is. There is a Caucasian male walking outside my window with an Indian walking stick, it has feathers on it, he is on a spiritual journey or looking for a decent taco. You do not see things like this in the ghetto. Sorry, don’t mean to be rude but I am tired of defending this beautiful and upcoming neighborhood. Art galleries are a wonderful addition to the neighborhood but art will make an enemy for life if it ever displaces La Estrella, El Huarache Azteca, or My Taco. Also, are we now differentiating between the “more desirable” NoYo district (North York, you heard it here first) and the rest of the neighborhood? Aren’t we all in the same boat? Part of me dreads the day I have to listen to someone harp on about living in the “more desirable” part of Highland Park but on second thought, all the Northeast Sneetches drink at Marty’s anyway.